This book is a catalog of the Jokelson Collection of cameo incrustations, or sulphides. This collection of 400 cameo incrustations, built over a period of 64 years, is considered one of the greatest collections ever assembled. Almost 400 pieces are illustrated. There are sections describing the history of sulphides and the techniques used to make them. There is also a brief biography of Paul Jokelson. Paul Jokelson is the founder of the Paperweight Collectors' Association. He has owned many of the world's rarest paperweights and is often referred to as the "King of Paperweights." 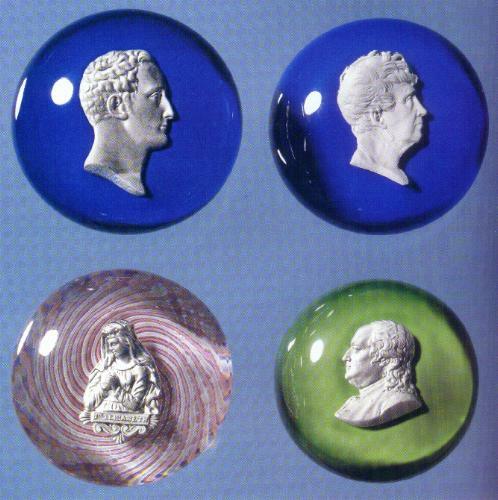 He is also the author of a number of books on glass paperweights. The terms sulphide or cameo incrustation identify a large and varied group of objects decorated with molded white cameos enclosed in glass. They were produced throughout the 19th century, but were largely forgotten by 20th century glassmakers until a revival in the 1950s. 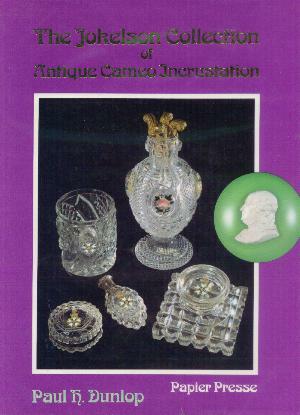 An important book that belongs in the collection of all collectors of antique paperweights. 128 pages with many color photographs. Hard bound. 9 1/2" by 11 7/8". 1991.